ALBUQUERQUE, N.M. — Today with 3D printing you can make almost anything in a matter of hours. However, making sure that part works reliably takes weeks or even months. 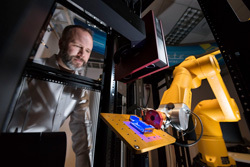 Sandia National Laboratories materials scientist Brad Boyce watches as the Alinstante robotic work cell scans a 3D-printed part to compare what was made to the original design. 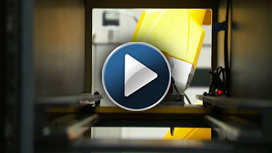 This test part was devised to push the limits of 3D printing technology. The goal of Alinstante is to speed up the testing of 3D-printed parts and materials science research. (Photo by Randy Montoya) Click on the thumbnail for a high-resolution image. They call this flexible, modular and scalable system Alinstante, Spanish for “in an instant.” Sandia is seeking industry partners to help expand or discover more uses for the new robotic testing system. “In traditional manufacturing of metals, there’s a lot of experience and finesse in process control to produce metals with uniform properties. When we went to laser manufacturing we had to take a step back and rethink qualification,” he said. Boyce had already developed a machine for high-throughput tensile testing — pulling on an object until it snaps — but for this project he knew he needed a more general, flexible solution. He turned to Sandia’s robotics group. The commercial robot sits in the center of the hexagonal work cell with up to six “petal” work stations around it. Each work station can have a different commercial or custom testing systems, and the work stations can be swapped in and out depending on the kind of tests needed. Also, because of the hexagonal shape, multiple petals can be combined in a honeycomb-like structure. That allows handoffs from petal to petal to provide almost limitless testing scalability. Click to view a video on Alinstante. Media wanting to download a version without text, click here (42 MB .MP4). “Sandia has testing labs that can perform all of these tests, however it takes a few weeks to schedule each of them, which can add up to one or two months of testing. Alinstante can reduce the scheduling burden for the testing, greatly speeding up the turnaround time,” said Burchard. Alinstante also reduces the chance for human error and produces data that is more consistent and reproducible than human testers. As a roboticist, Blada is looking forward to putting Alinstante’s endurance to the test. “In theory you could run this thing forever, if you had enough parts,” he said.